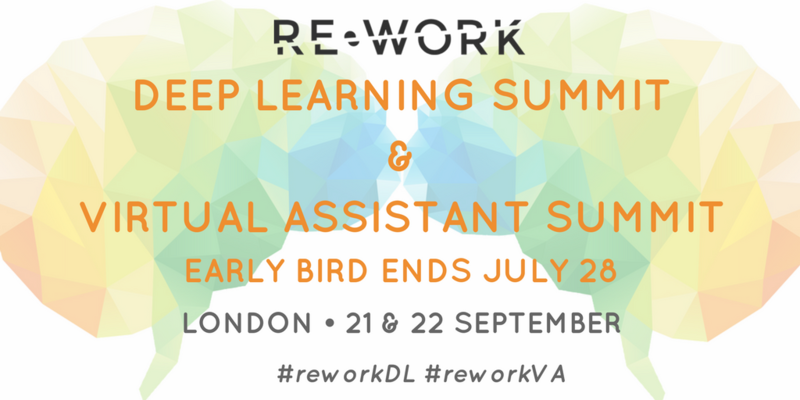 The Deep Learning Summit London and the Virtual Assistant Summit London will be continuing the RE•WORK Global Summit Series this September 21 & 22. This two track event will bring together the next generation in predictive and artificial intelligence, showcasing the most recent breakthrough technologies and research. Early Bird tickets are currently on sale and are available until 28th July. Register now to guarantee a spot at the summit. We are excited to announce the attendance of the ‘world leader in artificial intelligence research and its application for positive impact’, Google DeepMind. Back in 2010 some of the most successful technology minds in the world founded DeepMind which was then acquired by Google in 2014. At the Deep Learning Summit, both Irina Higgins and Jörg Bornschein, Research Scientists from DeepMind will be presenting their current work and the most current cutting-edge progressions in deep learning. Before joining DeepMind, Higgins was a machine learning tutor at Oxford after finishing her PhD in computational neuroscience and AI. Her aim at DeepMind is to bring together insights of machine learning and neuroscience to advance AI. In her talk, she will be focusing on automated discovery of early visual concepts from raw image data and how it’s a major open challenge in AI research. The unsupervised approach that Higgins is currently implementing to address this problem is learning disentangled representations of the underlying factors of variation. She will discuss how they are drawing on inspiration from neuroscience and show how this can be achieved in an unsupervised generative model. This can be done by applying the same learning pressures as have been suggested to act in the ventral visual stream in the brain. Additional confirmed speakers include: Shubho Sengupt, AI Research, Facebook AI Research (FAIR); Ed Newton-Rex, Founder & CEO, Jukedeck; Christopher Bonnett, Senior Machine Learning Researcher, alpha-i, Ankur Handa, Research Scientist, OpenAI. On this track, industry leaders will be exploring the next generation of predictive intelligence and showcase the advancing trends in VAs and their impact on business in society. Siri, Alexa, Cortana and Google Assistant may be known as ‘The Big Four’, but there are many other companies working on virtual assistants, and we will hear from industry experts, researchers, businesses and startups working to advance this technology in their field. Earlier this year at the Virtual Assistants Summit in San Francisco, we heard from Dennis Mortensen, CEO and Founder of x.ai, who sat down with us to talk about his current work. He spoke about how he began his work in VA to overcome a real-world problem he was facing. He explained that whilst 'no one wants to reply on VAs, you don’t want to have to do things such as set up your own meetings yourself. It’s time consuming and a waste of resources.' This annoyance for Mortensen was the catalyst to begin his work in VA. He spoke about his work in both supervised and unsupervised learning and the pros and cons of both methods to achieve the most effective VA.
Watch the interview here to see the type of subjects that will be covered at Virtual Assistants Summit, London. Previous speakers include: Deborah Harrison, Editorial Writer, Cortana; Nick Triantos, Managing Director, SRI Ventures; Oriol Vinyals, Research Scientist, DeepMind; Cathy Pearl, Director of User Experience, Sense.ly and many more. Both summits will focus on the cutting edge and emerging research in deep learning and virtual assistants, and we will hear from academics, industry experts, startups, and businesses both researching around these advancements, and also implementing them in the workplace. Is your company ready to use deep learning? Or could a virtual assistant save you time and money? Join us to find out more.